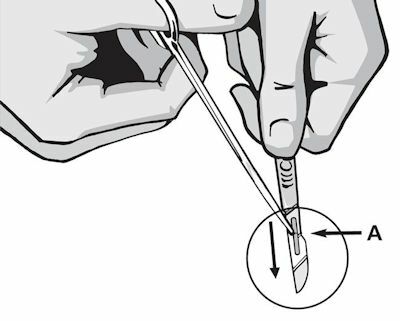 If you have to use forceps or needle holders to remove the blade from its protective packet ensure that you do not grip the blade across the cutting edge. Grip blade with forceps or needle holders at point A making sure that the cutting edge is facing away from hand and body. Ensure the blade is pointing downwards and towards the trolley and NOT towards another member of your team. Whilst holding the handle firmly lift the back edge of the blade with the forceps or needle holders and slide away the handle. The preferred method would be a Swann-Morton blade remover device.